They say there's no better way to see a country than by road. The freedom and sights of the open road are unparalleled to any other way of travelling. While Avis Car Hire's aim is to help people do this, they're now providing a new online guide that uses local guidance and a digital experience to inspire people to get behind the wheel. 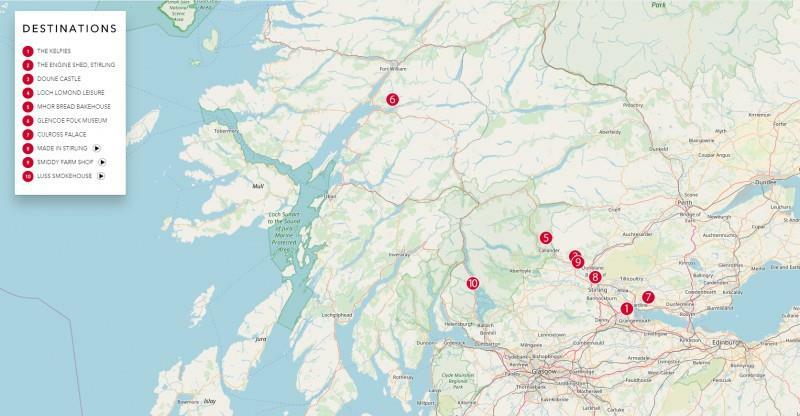 To help users discover more of Scotland, specifically within a day's drive of its capital Edinburgh, Avis has just launched a new interactive guide-map. When choosing and curating the trip destinations, they've worked with Edinburgh-based blogger Sonja Bolger, who operates the travel blog Migrating Miss. Sonja chose her 10 favourite 'hidden gem' destinations ranging across Scottish history, art, culture, activities, and most importantly, food. Then, with the assistance of an Avis car, she visits each destination and interviews the staff at some of them for more details. Sonja's contemporary knowledge of the areas gives some insightful and cool facts too – did you know that Doune Castle served as a set piece for Monty Python, Outlander and Game of Thrones? The microsite was designed using a mobile-first approach to ensure it renders swiftly and that it is simple for users to explore destinations whilst physically exploring the route themselves. The user interface design, which takes its roots from the aesthetic of the Inspires blog platform, is purposely clean, uncluttered and spacious in order to allow the content to be easily navigated and digested. Full-screen video is utilised in key areas to entice and draw the user in and immerse them in Sonja's experience. Each destination page within the guide features either an article about the attractions and area or a video interview with some of the people at the locations. The mixture of article and video formats (of which there are seven and three of, respectively) is a simple way to vary a user's experience of the guide and keep them engaged for longer. The imagery for each destination has been intentionally emphasised throughout, as visuals have been shown to be an incredibly effective way to get a response from users. According to research, when people hear information, they're likely to remember only 10% of that information three days later. But when a relevant image is paired with that same information, people retained 65% of the information three days later. As the articles are quite detailed, the visuals are a key factor to illustrate the user's journey. Overall, it reveals the push that brands are increasingly doing to improve their digital marketing approach to appeal to and connect with younger, digitally savvy audiences. The content is more user-friendly, personally engaging and relevant to consumer's aims and desires – and it seems to be a formula for success. Previous examples include hotel chain Jurys Inn launching the UK's version of Route 66 called Route 57. Air New Zealand also launched their own Emoji-powered interactive map, allowing users to get tourist recommendations through the emoji's they input *searches for wine/burger emoji*. Last year, Avis had launched a similar guide-map for Barcelona with another local blogger. In a world where travelling is the current obsession of the young, it seems interactive maps are helping to fill the digital nomads destination gaps.